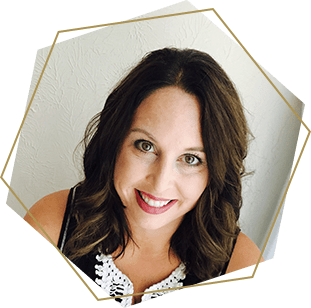 As moms, we can have high expectations while at the same time, can be pretty hard on ourselves. 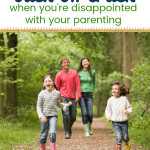 Maybe you’ve felt disappointed in your parenting skills, family behaviors or by just sheer overwhelm. You need to know that your role is important; you were called to be the mom of your kids…it’s not by accident. And, no matter how you might feel today, the reality is, you’ve got this mama!!! 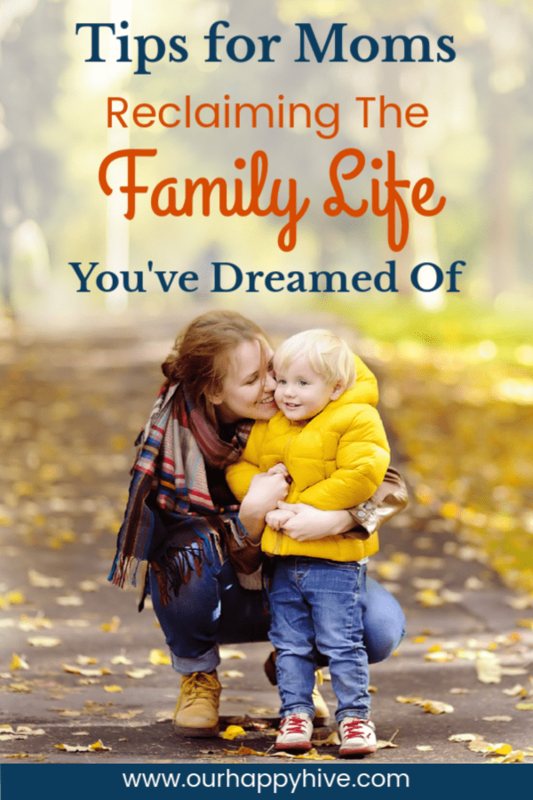 Read on about recovering from disappointment and creating the family life you’ve dreamed of. It’s not too late! Family has always been an important thing to me. My parents instilled this value in me from a young age. When I was in High School, we were nominated and recognized as “The Family of the Year” an award given by a non-profit in my hometown. As a teenager, I saw the faults in our family, but my mom had the wisdom to share with me that we weren’t a perfect family, just one that was committed to each other and willing to work through the rough patches. Did you hear that mama? Success as a family doesn’t require perfection! It requires dedication! As a single woman, I looked to the future with the dream of getting married and starting a family. I had high hopes for my future husband and family. I knew in my core that being a wife and mother would be an important calling and part of the bigger plan for my life. In my vision, I would have strong relationships with my children. I would be patient and kind. My kids would be well behaved and I would be flexible. I would instill values in my children and our faith would be a cornerstone to the way we live…not just a book on a shelf or a meeting on a Sunday. What vision did you have of your family before it came to be? As it turns out on any given day those things aren’t as easy as I thought. In fact most days I feel like I’m on a hamster wheel or just trying to get the most urgent priorities done to make our family run. I guess it goes back to Maslow’s hierarchy and the things that get attention are things like putting food on the table, making sure the kids are clothed, and that we all get a decent nights sleep (which often doesn’t happen). In the midst of my daily momming fails, there is a small voice inside reminding me of my vision, my original hopes, and dreams for my family. It’s easy to feel disappointed that I haven’t hit the standard I originally set or to question if I’ve already messed up my kids. But I think most moms feel that way from time to time…don’t you?!? The reality is, it’s not too late, I can continue to grow and change, I can continue to aim for that vision I had…and so can you! Tell me mama that you can relate. Tell me I’m not alone! Based on conversations I’ve had with other moms it appears this is a common occurrence. So what are we to do about it? Let’s collectively take a step back, remind ourselves of our vision, clarify our values, and make a commitment to one or two things we can work on changing. Let’s first remind ourselves of what we ultimately want in our family. I once heard you don’t make your decision about how many babies to have by what you can manage today, but by what you want around the Thanksgiving table in 20 years from now. What are the things that are important to you and your family? When you think about Thanksgiving in 20 to 30 years from now when you will be surrounded by your children and potentially grandchildren, what are the types of stories you want to share around the table? Are they memories of having a house full of friends? Having a community table where you ate dinner with your neighbors? Stories of playing and watching sports together or of having a family game night, maybe even teaching your children Bible stories that are foundational to your faith? Write down 3 to 5 characteristics or values you want to instill in your family. Once you’re clear on the things that are important to you, do an informal assessment of your current life. Are those identified traits/values part of your family life? What types of activities does your family do that reinforces those values? How much time do you dedicate to those related activities? Are they at the level you anticipated or would hope for? 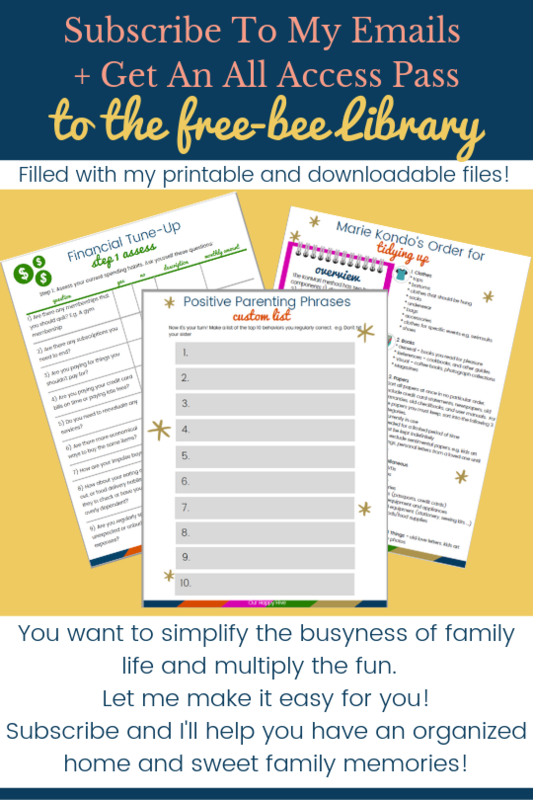 Ok, so, if your family life isn’t stacking up to your vision…fight the urge to get too down on yourself! Let’s focus on the future and not the past. This is the time to make changes. Identify a few things to work on, no more than 2 or 3. For example, if you desire that your family have special memories of having fun together, are there simple changes you can make this week or this month to create more opportunities for fun. Like having a family game night or setting up the space to do a family puzzle as time permits. Maybe on Fridays, you make pizza together. When I start thinking about it, to make room for these things I value is not necessarily an entire overhaul of how our family works, but tweaks. In essence, it is double-clicking and zooming in closer to elements that are already in our lives to some degree. Are there behaviors that need change? For example, if you desire a peaceful home, do you find yourself raising your voice too much? (truth: I know I do.) Maybe you find your kids are too over stimulated. Maybe it’s time to cut back on TV or ahem sugars to help them calm down. Or maybe they need a better way to get excess energy out like engaging in some sort of physical activity. Write down the most significant barriers that come to mind and the action you’ll begin to take to remove them. Notice, I did not say “ALL”…I did not say to write down ALL barriers. The goal here is to make actionable steps and to avoid overwhelm! Feeling overwhelmed is easy for many moms. Often we’re hard on ourselves. But did you know that you have a HUGE purpose!!! Being the mom to your kids is not by chance. I believe you were matched specifically with your kids and they need what only you can give them. (I could go on a huge bunny trail with this point, but for brevity, I won’t in this post) Bottom line, your kids need you. Within, you have the skills to do this very important job. Sure, maybe you have some areas for improvement and something to learn but it’s not too much and you are enough! No matter your kid’s age you don’t have to settle with the behaviors you don’t like in you or in your family. As long as you’re living there’s still time for change. Commit to taking it one day at a time and focusing only on one or two goals of behavior change. Commit to acknowledging your strengths and patting yourself on the back. Mama, we need each other! It can be very lonely when you feel like you’re the worst mom ever, that your temper had the best of you, or when you’re faced with a situation that you just don’t know how to handle. These are the times we need other mamas the most. Yeah, it takes a little vulnerability and sharing which may not always feel comfortable. But this is too important! It’s time to step out of your comfort zone and connect with those around you. 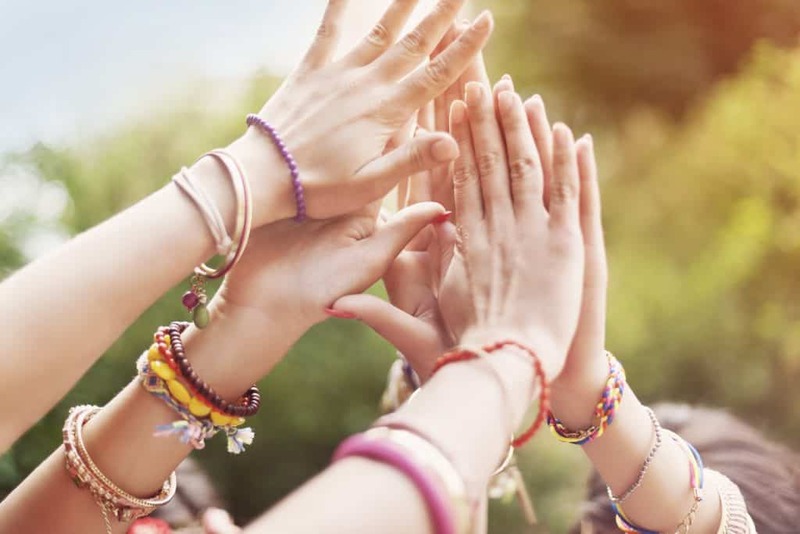 Maybe you need some ideas on how to find your tribe, a group of moms that are in the trenches with you. If so check out this post. Creating the family we’ve always dreamed of isn’t easy but it is possible. Don’t settle or resign or assume you’re just a bad parent. Remind yourself of you’re calling and your purpose, identify things to change and surround yourself with the tribe of others that are in the same situation. You are too vital and your role is too important to remain stuck in the hamster wheel of Family life. You got this mama, go forward and create the family life you’ve always dreamed of!